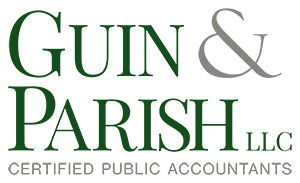 Guin & Parish LLC is a Marion County, Alabama based CPA firm providing professional services to clients located throughout Alabama, Mississippi and point beyond. Our partners and staff have decades of experience in the service areas of accounting and bookkeeping, individual, partnership, corporate, trust, estate and non-profit income taxation, business payroll processing, governmental auditing, management consulting and advisory. With two full-service and fully staffed offices to serve you in Hamilton and Winfield, we are one of the largest CPA firms in Northwest Alabama. And with one of the longest practicing CPAs in the State of Alabama (Mr. Johnny Mack Lawler has been in public practice for more than 50 years) serving as one of our partners, we have the experience, the wisdom and the knowledge-base to serve you like few other firms can. Our commitment is to provide our clients with confidential, quality, timely and affordable professional services that truly benefit our clients. Please feel free to contact us at one of our two offices below and see how we can help you or your organization.